Does your dog dart from the room when you pick up her muzzle? Does she paw at her muzzle and attempt to remove it when you put it on? 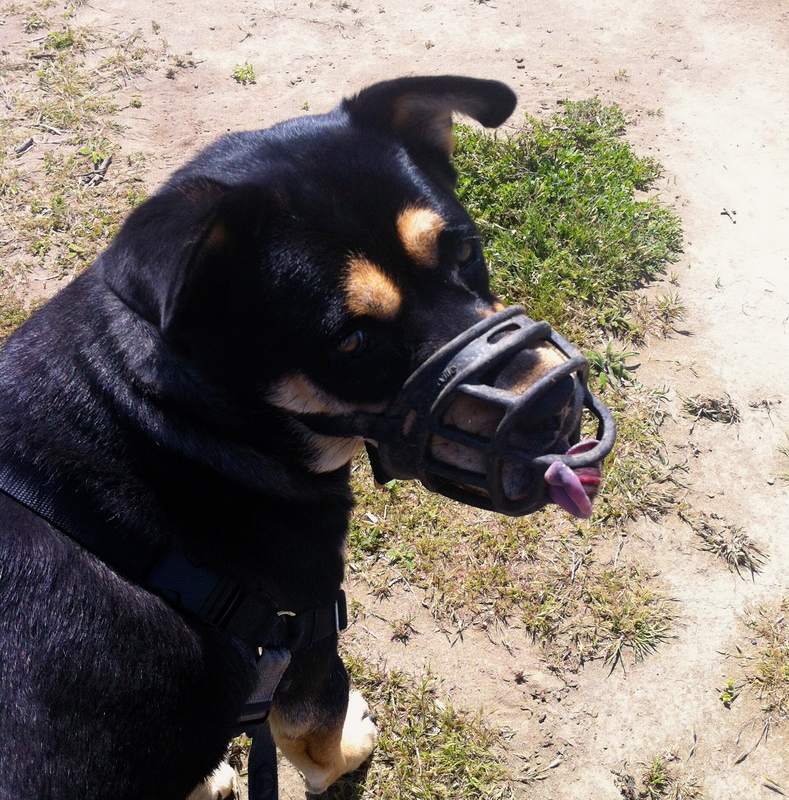 Chances are, your dog needs a muzzle training refresher. While most dogs habituate to collars and harnesses without training (meaning you can put one on your dog and go), muzzles can be aversive and anxiety-provoking if they’re placed on the dog without a proper introduction. The good news is, through training, muzzles can be safe and humane, and dogs can learn to associate them with good things like walks, playtime, and off-leash hikes. Putting it into practice: Take a look at this standard muzzle training plan and refer to it while reading the rest of this post. The most important concept to remember when muzzle training your dog is to go slow. Desensitization and counterconditioning work, but cannot be rushed. Resist the urge to proceed to the next step in the training plan before your dog is ready, as this will slow the process down. Returning to the example of a person with a fear of heights: If he suddenly jumped from the second floor to the 10th floor, he’s likely going to trigger or exacerbate his fear. You will know your dog is ready to advance in the plan because he will show a positive conditioned emotional response (a +CER for short). Your dog has many CERs already installed – some positive, some negative. The excited barks, expectant look, and wagging tail your dog displays when you put your shoes on and pick up his leash is a +CER because he knows shoes + leash = walk time. The tucked tail, averted gaze and hunched body when sitting in the vet’s waiting room is a -CER, because he knows that the waiting room = shots and uncomfortable procedures. When your dog shows these signs, then and only then should you proceed to the next step. Once you have a +CER, keep it strong by preserving the 1:1 ratio between the muzzle and the reward. Your dog will form the strongest emotional response to the muzzle if it always predicts a reward (whether that be a treat, a walk, or playtime with a favorite toy). Dogs form such strong responses toward their owners picking up a leash, because, in most households, picking up a leash always leads to a walk. The same goes for crinkling treat bags and picking up the food bowl. So remember: If you pick up the muzzle, make sure your dog receives something terrific. Not just OK or somewhat fun, but absolutely, mind-bogglingly terrific. Dogs are masters when it comes to flowcharts. They learn which behaviors lead to which consequences, and which events lead to other events. They also live in the moment; they care about the consequences that happen immediately after the behavior and the events that immediately follow other events. Owners need to keep this in mind when muzzle training. The muzzle must always precede the reward. This also includes anything that serves as a tip-off that the reward is coming. Consider all the actions involved in giving your dog a treat: bag crinkling, wearing a bait bag or having treats in your pocket, reaching in your pocket, the smell of the treats. These are all tip-offs and can easily muddy the waters during muzzle training if you’re not careful. – Present the muzzle before doing anything else. Reach for the treat, crinkle the bag, etc. after the muzzle appears. The muzzle always comes first. – Wear a bait bag around the house when you’re not training to reduce its salience. – Prepare treats ahead of time. And, as always, contact a positive-reinforcement trainer if you run into any difficulties or are concerned about your dog’s behavior. Stay tuned to The Muzzle Up! Project, as we will continue providing more content and videos on muzzle training.